It’s still freezing outside and you’re not ready to transition your home to full on Spring Decor. I get it, neither am I. In a prior post, we talked about transitioning Christmas Decor to Winter HERE. We took down the trees, got rid of all things Christmasy, but still left our home feeling like Winter. Let’s take another step and bring in some cozy elements that will transition easily to Spring. Look no further than your local grocery store. This is such a beautiful time of year to bring fresh flowers into your home. These gorgeous pink hydrangeas were a grocery find and have lasted nearly a week so far. 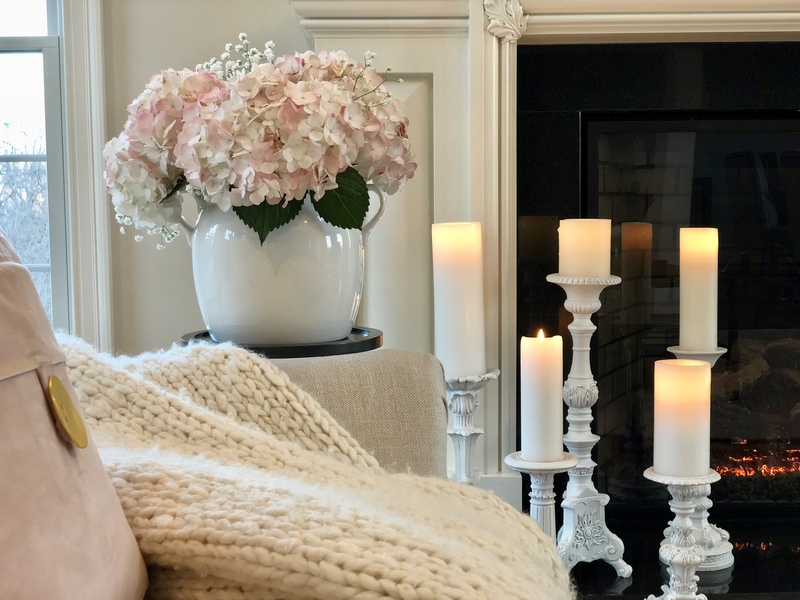 If you are wary of brining hydrangeas home because they wilt quickly, check out my post for a surefire tip on how to bring them back to life HERE. Bring in a chunky throw HERE. Cozying up in a chunky throw on a cold day with a cup of tea, is my recipe for happiness. The throw will transition well into Spring, I will leave mine out through March. Bring out all your candles, the more the better. Nothing says romance like the flickering glow of a candle. They will brighten up any room. I recently painted these candlesticks from gold to white using spray paint, you can check out post HERE. Bring on the blush! This beautiful color is perfect for Winter, Spring, and Summer. I recently bought these soft pillows from Home Goods and am thrilled at how they brighten the room against my neutral tones. Add in a furry sheepskin rug HERE, it adds warmth to any space in the home. Looking for a versatile piece of decor, I love my bar cart HERE, I have used it on so many occasions and holidays. Those are my tips for transitioning to Spring decor without saying goodbye to Winter – Done the easy way. Hope you are enjoying your bi-weekly Happy Haute Home posts, please subscribe to have them delivered right to your inbox. If you’re looking for daily decor inspiration, follow along on Instagram HERE. See you next time and follow along on Pintrest HERE, and Twitter HERE and feel free to pin and tweet your favorite pics from Happy Haute Home. Next Post Is It Possible to Paint a Granite Surface? Absolutely gorgeous! And I love the way you use an essentially neutral palette as the foundation for your home so that you can add a variety of colors and decor for each season and holiday. So smart! Thank you Lynn!! I love neutral for sure. I have made many costly mistakes in the past going with flowery patterned sofas..only to hate them shortly after. Neutral is the way to go for me! Lovely blog and great ideas! I truly enjoyed this post. You have excellent taste! I love the pink hydrangeas, bar cart, and the blush pillow. Thank you Maria! How sweet of you, I appreciate you visiting. Beautiful. I absolutely love your use of colors. This color palette is one of my absolute favorites!! Thank you, so sweet of you to comment and visit! Great post – I totally love the candle sticks!! Thank you! I am always finding new places in my home to put them, so versatile. Thanks for visiting. Thank you! Appreciate you stopping in for a visit.